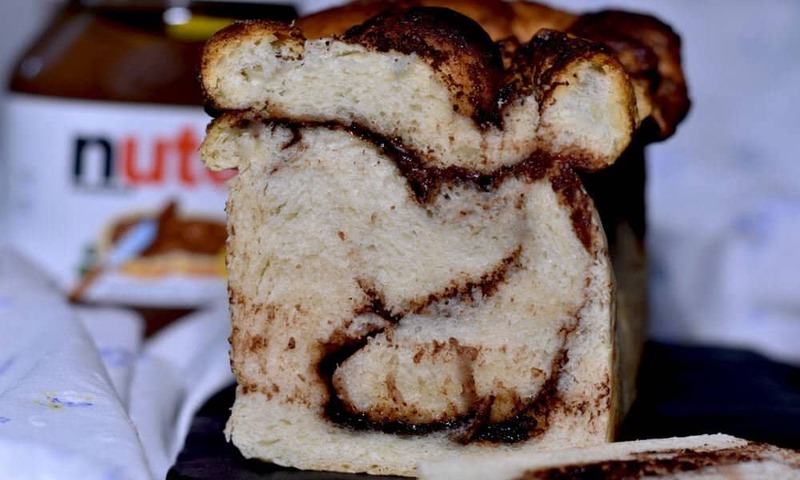 Chocolate Cinnamon Babka Bread is a version of Babka Jewish bread. 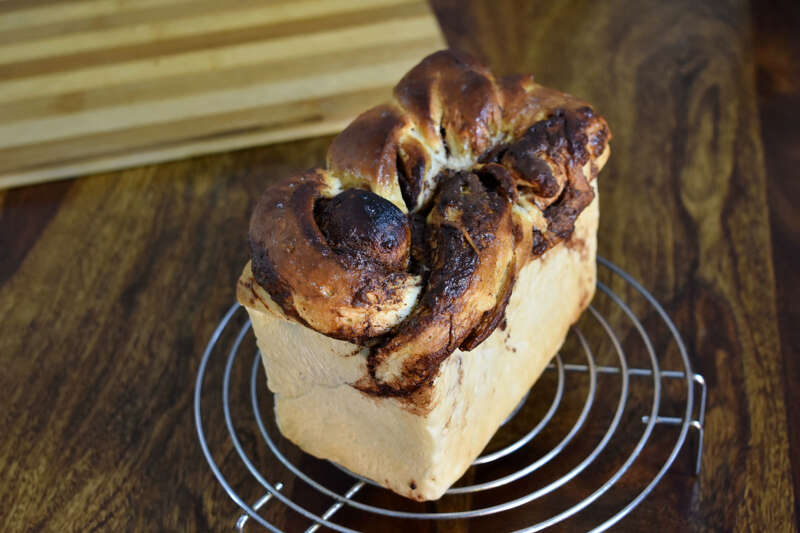 Babka bread shaping is quite similar to challah bread however, it differs texture. The texture of this babka bread is more like a cake. That is why few people categorize it as a cake-bread. Babka history is dated back to 1800s and was first made by Jewish people. The ladies used to make extra dough for Challah and then fill it with chocolate, cinnamon or fruit jams to make Babka bread. Then it got baked and was reserved as a special treat. While reading more about Babka bread, I noticed it’s a form of yeasted cake. And I could relate to it as the texture of Babka bread is quite similar to my Yeasted Lemon cake. 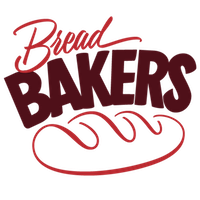 Felt lucky when I was given the opportunity to host and decide the theme for Bread Bakers Group for April month. I knew what I am up to and decided on the theme to be braided bread. I baked Chocolate Cinnamon Babka which was an immediate hit in the family. And I very well knew that it will become popular at home. I so very know my kid. He does not like cinnamon, but when cinnamon gets combined with chocolate, it creates magic. My little greedy devil gobbled maximum portion of this chocolate babka bread. First, take a large kneading bowl and add flour, salt, and sugar in it. Mix everything and make a well in the center. Now add yeast and 50 ml of lukewarm milk. Let it rest for about 5 minutes and you will see the yeast blooming. Once the yeast froths start mixing everything together. Add the rest of the milk and start binding the dough gradually. For all the given measurements for babka bread, I have used 180 ml of milk in total. The dough is going to be extremely sticky in the beginning but just don’t worry about its stickiness. 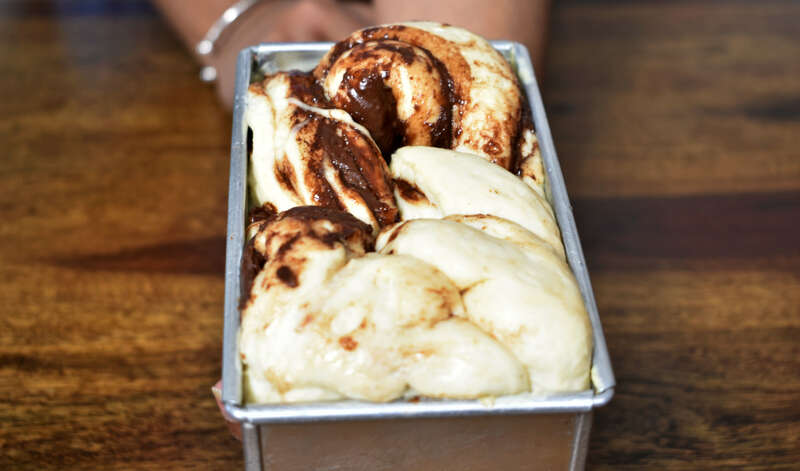 Knead the babka dough and it will become perfectly elastic, non-sticky, and firm once we the kneading is done. It’s time to add butter to the babka dough. Butter should be soft so it easily mixes into the dough. Continue kneading until the dough becomes non-sticky. For me, it took approximately 7-8 minutes to get the desired texture of the dough. Now the dough is ready to go for the first rise. Grease the bowl and keep the dough into it. Cover the bowl with a cling wrap to avoid crust formation and let it rest until it doubles in volume. These days the temperature at my place is about 31 °C and it took 40 minutes for my dough to be double in volume. Take temperature at your place in consideration as the proving time will vary based on the temperature at your place. Wait until the dough doubles in volume. Once doubled, punch the dough to release the air. 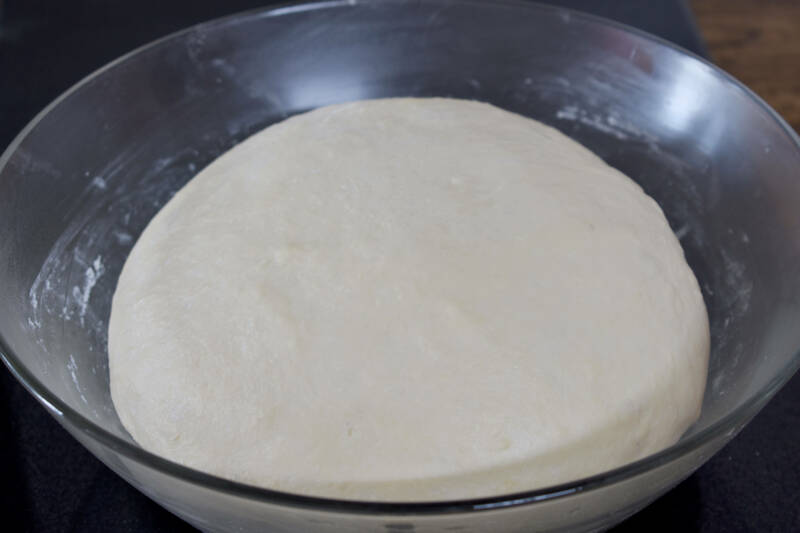 Now take the dough out on a lightly floured surface and roll the dough using a rolling pin. We need to roll the dough into a rectangular sheet measuring 8”x12” inches. 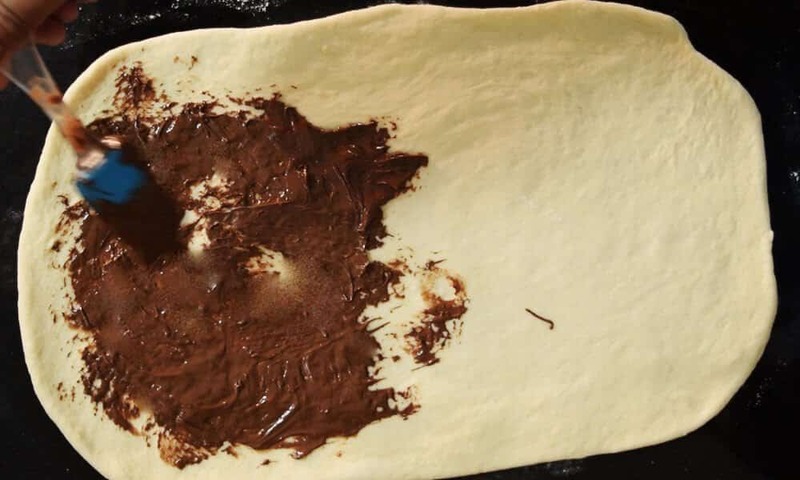 Once you have rolled the dough to desired dimensions, spread the chocolate spread on it. 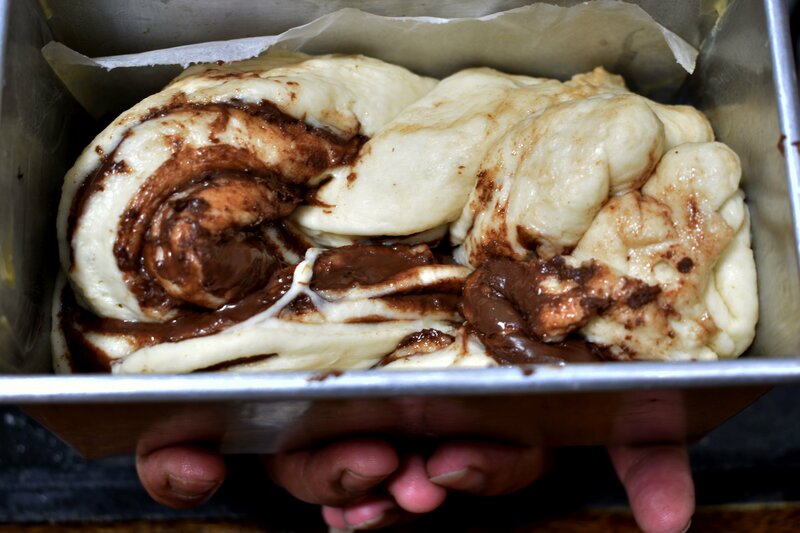 Use a spatula or a spoon and spread an even layer of chocolate spread on the dough sheet. Further, sprinkle cinnamon powder on top of the chocolate spread. PS: Remember to leave ½ inches border all around the dough sheet. Do not spread chocolate spread or cinnamon on it. Otherwise, it will be difficult to lock it while shaping. Now start rolling the sheet lengthwise like a roulade. Gently press to seal the ends. Now place it on the counter with seam side facing towards the counter. Using a knife or scraper, cut it lengthwise from the center into two equal halves. With the cut side facing up, start braiding. Line a 6x3x3 inches tin with parchment paper and place braided dough in the tin. Cover it with cling wrap and let it rest until it again doubles in volume. Meanwhile, keep the oven for preheating to 180 °C. I generally bake my bread at 200 °C but this bread has chocolate and I don’t want to take risk of burning my bread so I opted to bake it at a bit lower temperature. Before baking, brush the dough with milk and then bake it in preheated oven for 25 minutes. When baked completely, take the loaf tin out from oven and immediately demold the bread and place it on a cooling rack. Let the baked Babka rest for 2 hrs before slicing. You will be delighted to know that you just baked a piece of beauty. 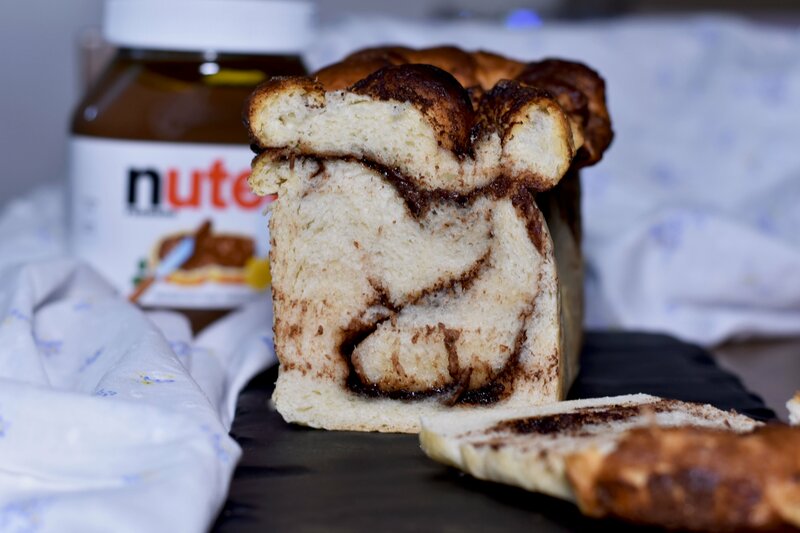 Dip each slice in Nutella and forget yourself in the delightful and flavourful best chocolate cinnamon babka bread with cinnamon. This is one of the easiest recipes of babka bread. Have a slice. Cheers! If you like my recipes, follow me on Twitter, Facebook, and Instagram. If you like to watch video recipes, check my YouTube Channel for more amazing recipes. The theme for this month is “Braided Bread”. 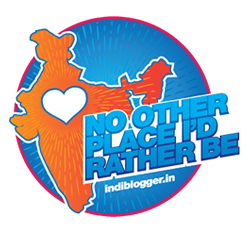 Our host of the month is Sonia Gupta at AnyBodyCanBake. Check out what the Bread Bakers have baked. When chocolate and cinnamon combine together magic happens. I added this magic in my super delicious and buttery Chocolate Cinnamon Babka Recipe. This is one of the best Babka bread you will ever have. In a large kneading bowl add flour, salt, and sugar. Once the yeast froths start mixing everything together. Add the rest of the milk and start binding the dough. Knead the babka dough and it will become perfectly elastic, non-sticky, and firm once we the kneading is done. Add butter to the babka dough. Mix it well and keep the dough in a greased bowl. Let it rest until it doubles. Once doubled, punch the dough to release the air. Now take the dough out on a lightly floured surface and roll the dough using rolling pin into a rectangular sheet. Use a spatula or a spoon and spread an even layer of chocolate spread on the dough sheet. Further, sprinkle cinnamon powder. Using a knife or scraper, cut it lengthwise from the center into two equal halves. With the cut side facing up, start braiding. Line a 6x3x3 inches tin with parchment paper and place braided dough in the tin. Cover it and let it rest until dough rises to the rim of the tin. When baked completely, take the loaf tin out from oven and immediately demold the bread. Place it on a cooling rack. Let the baked Babka rest for 2 hrs before slicing. The amount of milk can vary depending upon four quality and weather conditions. So in case you are adding extra milk, please add 2 tbs at a time. I have used homemade chocolate spread, however, you can use market made sauce or Nutella for same. Replacing all-purpose flour with any other flour can change the results. Feel free to experiment. Baking time can vary depending upon your oven model and size. So keep an eye.